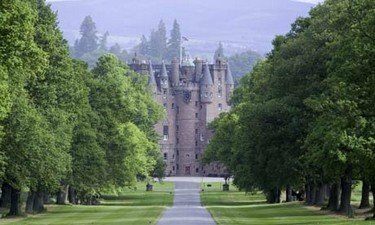 Have You Ever Wondered What a Vacation in a Castle in Scotland Would Be Like? In Scotland you can experience that magic! Castles are places of endless fascination.. Secret rooms, endless winding corridors, baronial halls, vast glowing fireplaces, mysterious paintings of ancestors on the walls, ghostly presences, spiral staircases.. Growing up there I visited countless castles..
and this is just a start! inhabited for 6,000 years..at least! the inspiration for writers and poets..
such as Robert Louis Stevenson, who wrote "Treasure Island"
and of course "Harry Potter" fans the world over already know where "Hogwarts" is! I had a magical childhood growing up in Broughty Ferry... No, you probably won't find it on the map..It's a little fishing village near Dundee. By the way, it's really close to Carnoustie, but I didn't play much golf there.. I built some wonderful summer sandcastles on that beautiful beach though! When you come to visit, you probably won't have as much time as I did. I want you to make the most of every second to experience the magic and hope this guide will help you to organise your visit whether you have a few days... a few months.... or even the rest of your life to spend here! Scotland is romantic, wild and beautiful....let it inspire you too...! The BlogScot keeps you up to date with all additions and changes to the Insiders-Scotland-Guide.com Web Site. The beauty of Scotland accommodation is that it is as individual as you are.